All dental clinicians dream of a dry field. It’s the one thing we must have for a procedure to be successful. How in the world do we maintain a site without saliva? Thankfully, this has become much easier since the ingenious development of Microcopy’s NeoDrys. This simple addition to my tray has revolutionized my most difficult patient situations. 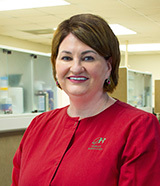 Being a dental hygienist, I don’t have the luxury of having an assistant. Neodrys have allowed me to triumphantly and comfortably finish the procedure without repetition. However, they aren’t just for hygienists. Dentists and assistants also love Neodrys because they make the most challenging patient easier to handle. Let me tell you how we accomplish the impossible with the aid of NeoDrys. “Ouchless” Comfort Edge- New technology creates flexible edges with no corners while retaining integrity. This allows for no cutting or binding, retracts the check, and serves as a mouth prop keeping the patient’s mouth open effortlessly. However, the patient can still move their cheek without any discomfort. Gentle to the Buccal Mucosa- The Medical-grade poly netting which faces the Buccal Mucosa adheres gently and prevents any irritation while maintaining exceptional sealing. They are also the perfect size to cover the entire area and can be placed far enough back to easily treat even third molars. Superior Absorbant Core- Acrylate polymer retains moisture as a gel when in contact with saliva. It traps the saliva and doesn’t allow even a drop to escape. There is also very little swelling of the NeoDry as it fills with saliva. With a fifteen-minute working window before there is a need to replace, I rarely have to replace the NeoDry during a procedure. Core Stiffener- Polystiffener Insert provides optimum rigidity for check retraction. We’ve all had that patient with very full checks. They open their mouth, and you can’t even see their teeth. NeoDrys solve this problem beautifully. By keeping the cheek retracted, not only is visibility improved greatly, but also the cheek is physically out of the way providing excellent access. Protective Backing- Choice of ReFlective or Original white backing brightens the oral cavity while providing cheek protection. As stated earlier, I’m a hygienist working alone. The addition of the ReFlective backing has been a life saver for me because it allows for phenomenal lighting. Saves you Money- Forget all those “parotid shields,” gauze, and cotton rolls which fall apart and get saturated quickly. NeoDrys save you time and money by getting the procedure done right the on the first attempt. Nothing is worse than getting near the end of the procedure only to have it become contaminated with saliva. I dislike having to tell a 6-year old that we have to “start over” because it makes us both feel like a failure. Easy Placement and simple release- Select the NeoDry size which adequately covers your patient’s mucosa. Insert gently with the color side against the cheek and point to the back of the mouth. In mere seconds, the NeoDry will begin to adhere to the tissue. The NeoDry will stay exactly where placed and won’t move until you’re ready for removal. You simply wet the absorbent side facing the mucosa for easy extraction. It comes out as one piece without any loose fibers to be cleaned out after the procedure. NeoDrys outperform the competition and have a “no questions asked guarantee”- perhaps the main reason you should try Neodrys. You have absolutely nothing to lose and everything to gain. Microcopy has developed this remarkable award-winning product, and you don’t want to waste another day struggling with yourself and your patient. When you try NeoDrys, you’ll wonder how you ever performed procedures without their help. Available in two sizes- NeoDrys are available in Large (Blue) and small (Yellow) color coding for quick identification. When you combine all of these qualities, NeoDrys become an intricate part of your routine. They are the “extra set of hands” I need to perform a rewarding procedure which is effortless for me and comfortable for my patient. This product is a game changer, and it will make your life as a clinician easier and more efficient.